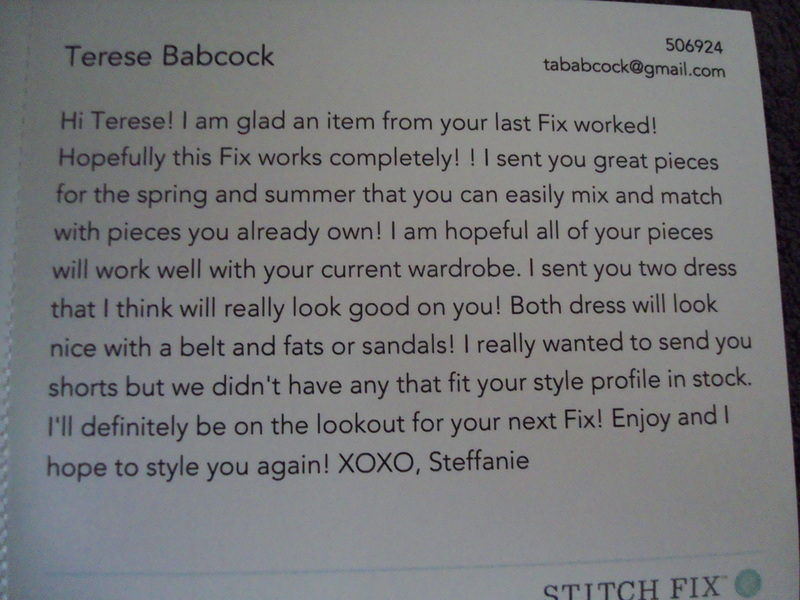 My StitchFix box was waiting for me when I returned from Costa Rica and I was really excited to try it out again after last month’s FIRST success and the nice little note they sent me. I should have tempered my anticipation so I wouldn’t have been so disappointed. 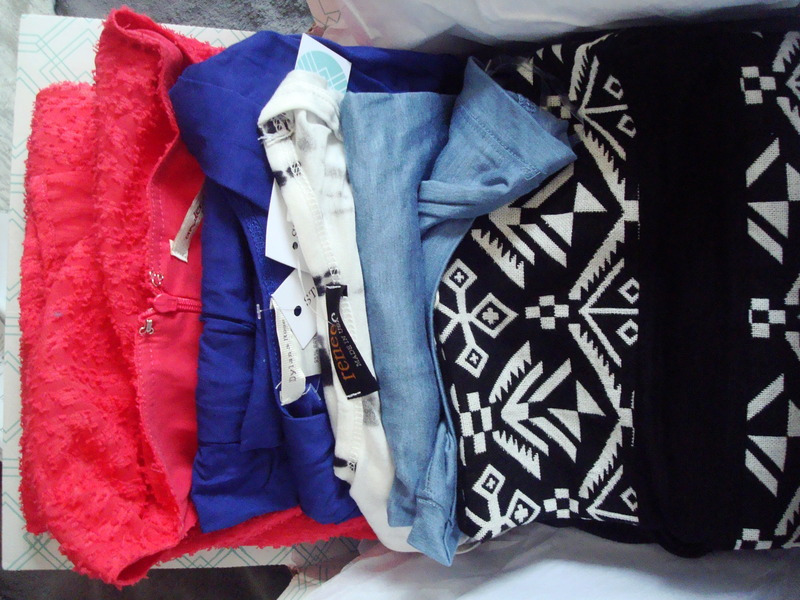 It was definitely a more colorful array of clothing this time and all colors I like…except the prints. WHY send me prints?! How many times can I say NO PRINTS? First annoyance. Long note from my stylist. Who really isn’t “my” stylist, since this is the fourth one assigned to me in four Fixes. I would think that if a stylist did good one month and was praised for it (and actually REQUESTED by the client) they’d be assigned again. Not the case. This time in the luck of the draw I got Steffanie. (And we’ll just overlook the abundance of grammar and spelling issues therein…it’ll be hard but they aren’t the focus on this post.) A little proof to the “I don’t think they read my profile” theory – “I really wanted to send you shorts…” – although I’ve explicitly stated no bottoms. Smaller annoyances just from this note alone but we’ll wait for the clothes to see if this Fix is good or bad. Let’s start with my least favorite to the potentially keepable. Oh no. A print. A subtle tie-dye print but a print nonetheless. It’s just my personal taste but I simply do not like most prints. It has to be something special for me to like it. And this wasn’t special. 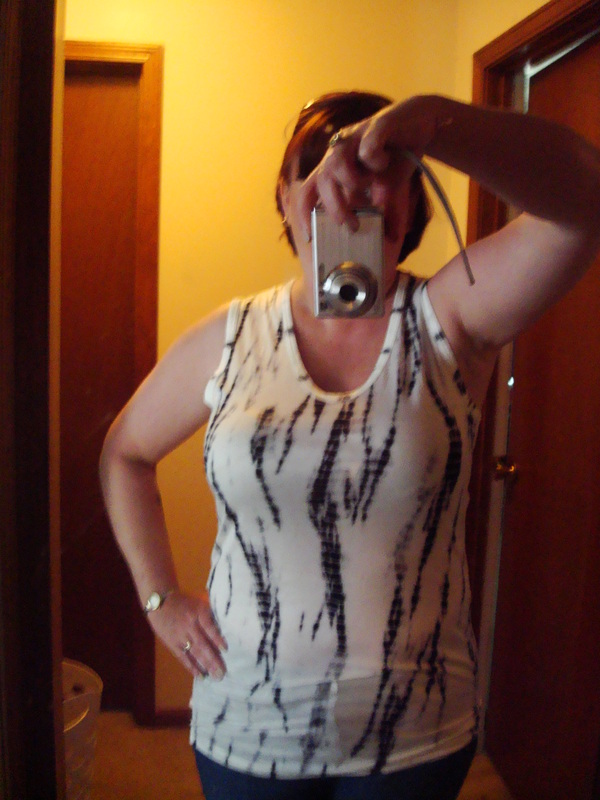 Even if I had liked the print, the fit was way off. Tight on the bosom and loose elsewhere and showing off every last bumpy bulge. Plus…see-through! 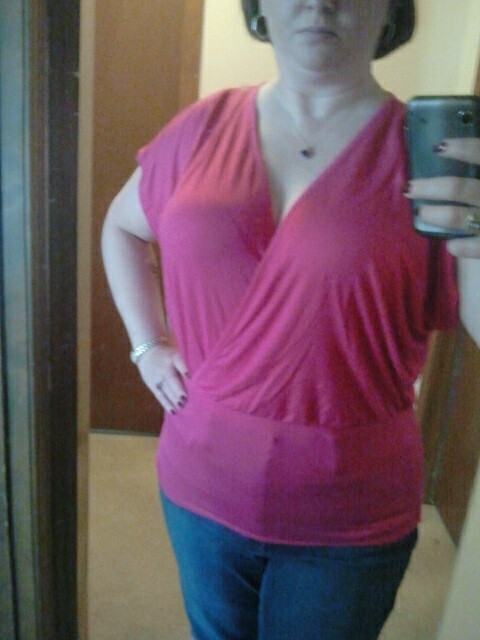 Yep, I bet people really want to see my belly through the shirt. Into the return bag it goes. 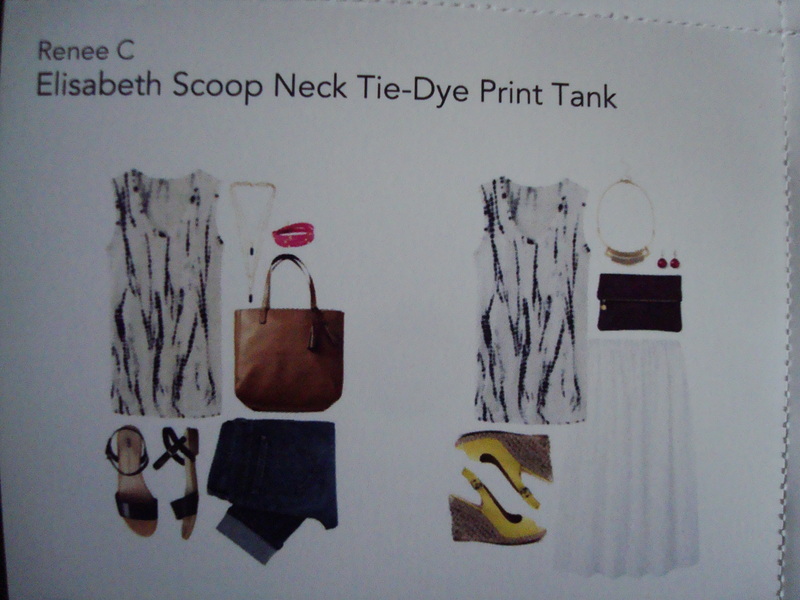 Oh…hey there, print tank. I really don’t even want to put this on but part of my personal code for doing these boxes is that I will try everything. So, on it went, grimace, quick photo and off again. 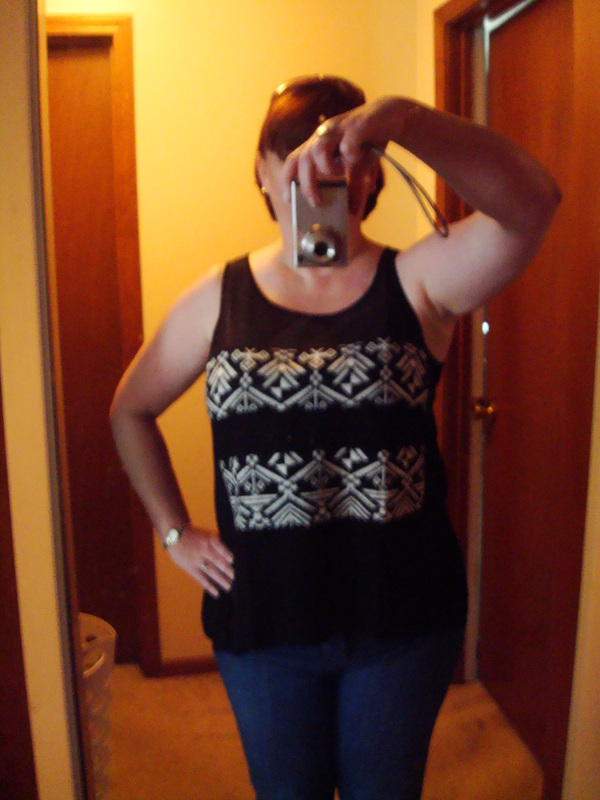 The fit was marginally better than the tank above but the pattern was just…ugh. Gone, Baby, Gone – back in the bag you go! This had potential. It’s a very good color! 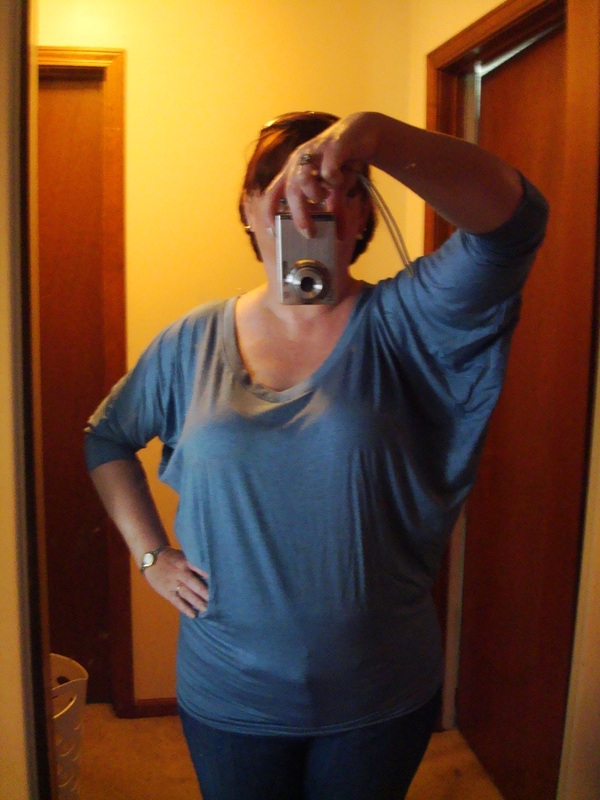 And I like cross-front things – they tend to flatter my chest (although this one didn’t). But…on? Such a huge NO. 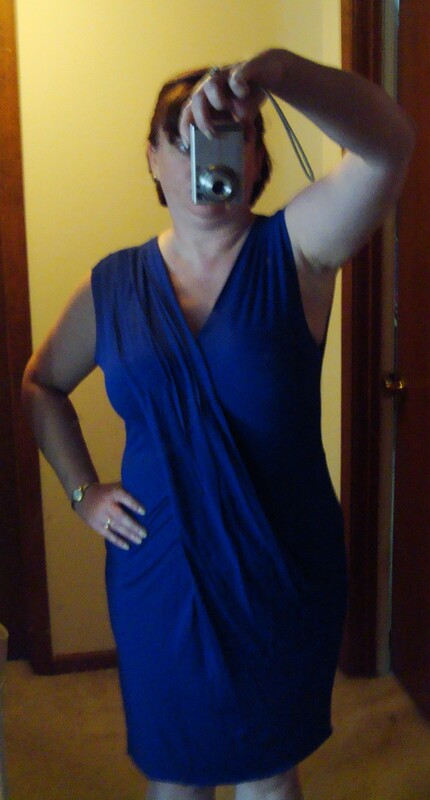 Even if I HAD like the fit on me, there was a rip in the right-side skirt seam. Not paying for a ripped dress. Buh-bye pinkie. Wait…what? 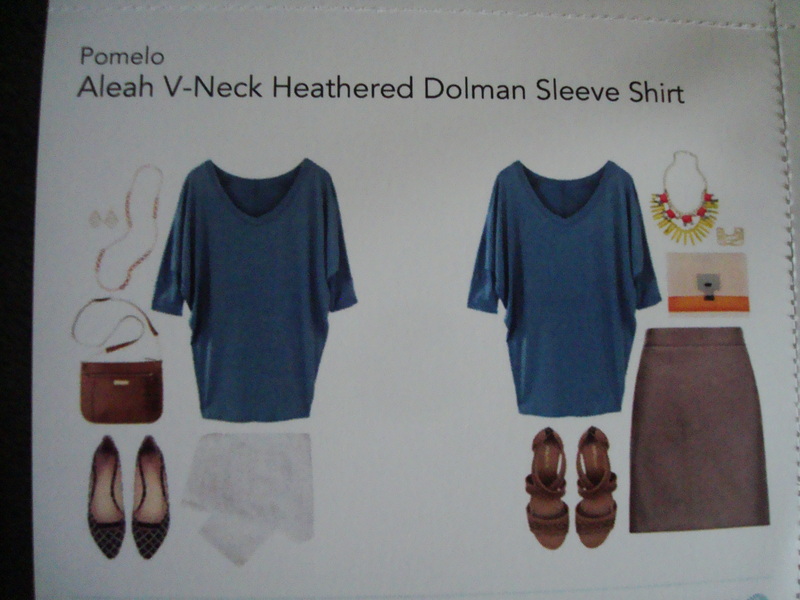 A v-neck heathered dolman? Or should I say ANOTHER one? Like that green one in my FIRST box that I sent back?! (below: Green is the 1st Fix, Blue is this Fix). 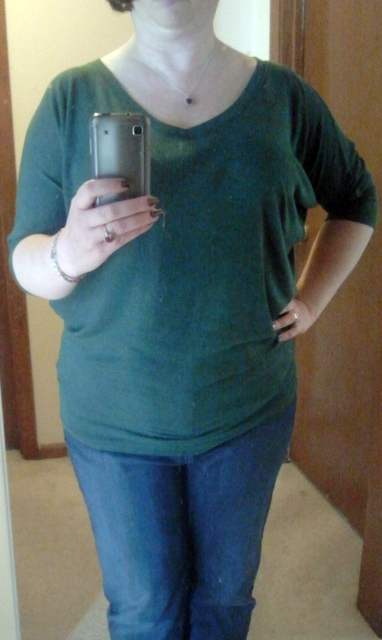 I liked the blue color but the fit was looser than the green so it made me look even more frumpy. Dolman sleeves are NOT all that attractive. (To be fair, I DID like the pink one last time because of the crossover front and extremely fitted waistband – but those factors weren’t in THIS shirt.) I don’t like frumpy. I like shirts to be more fitted, but not skin tight. 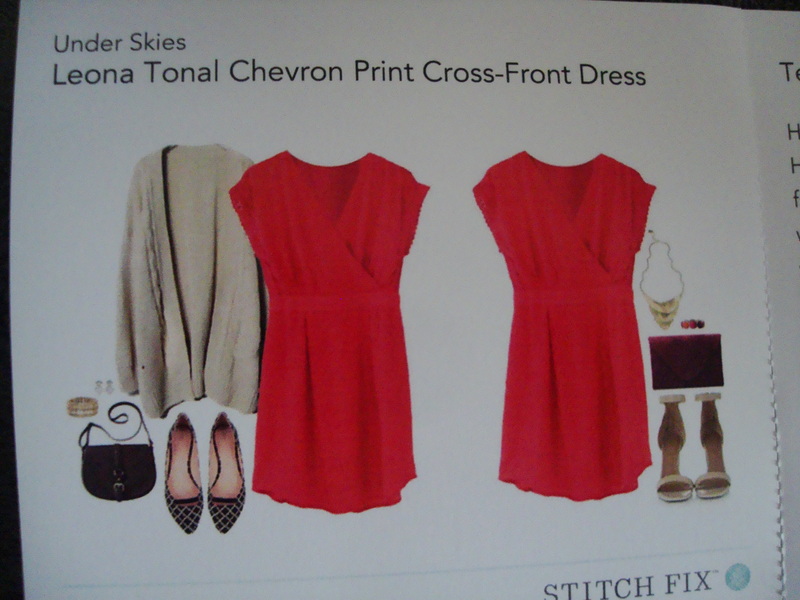 Alliteration in a dress description! 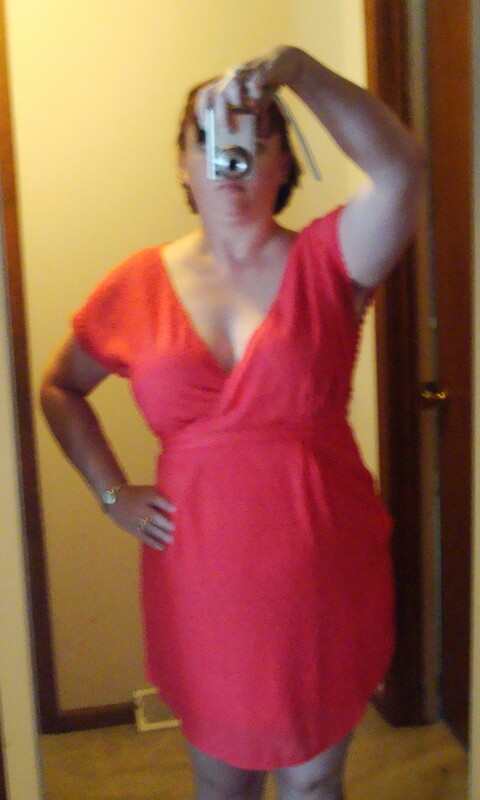 There’s a point in favor of this dress just for that, geek girl that I am. But, a single point wasn’t going to save this look. It was not attractive. Except the color. LOVE the blue! Probably why I have three or four dresses in similar hues. 🙂 The weird drape detail across the front made me look asymmetrical and what little hourglass there is to my curves was completely lost. Back in the bag, blueie. Five on, five gone. Truth be told, I feel like this Fix went backward…all the way back to the first Fix. Nothing truly fit right, nothing was flattering on my figure and nothing was really within my style. I’ve been pretty explicit in my responses on items, I have a pretty thorough style board on Pinterest and I have a no-holds-barred policy on this blog – I say exactly what I think about the items. But I feel like they just aren’t reading it or taking the time to make a good Fix. And that is what’s most disappointing. At least on my last box, there were several things with potential and likable aspects, I just decided to keep the one top (and I still love it! Would wear it everyday if I could!). I really want to like this service – it seems like such a good idea! But, I think there are a few flaws in the system. Changing stylists each month just seems inefficient. They can’t learn “their” clients that way. Is there a database to keep each like or dislike and why the client felt that way? 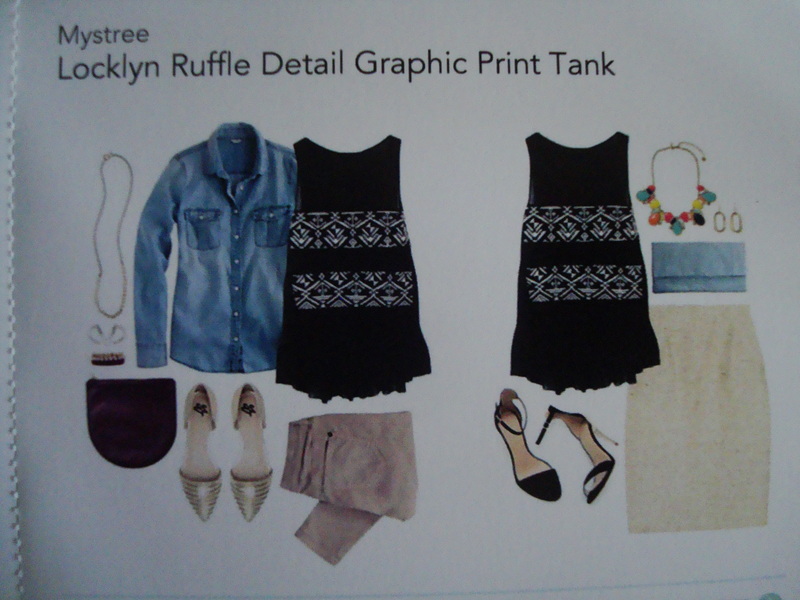 Is there a way to match inventory to clients before a Fix and the stylist narrows it down to five pieces to send? What’s the policy if there aren’t enough items to send or nothing really matches their style? Part of the job I do includes business analysis and workflow procedures so these are the types of questions I ask myself for most businesses I interact with. 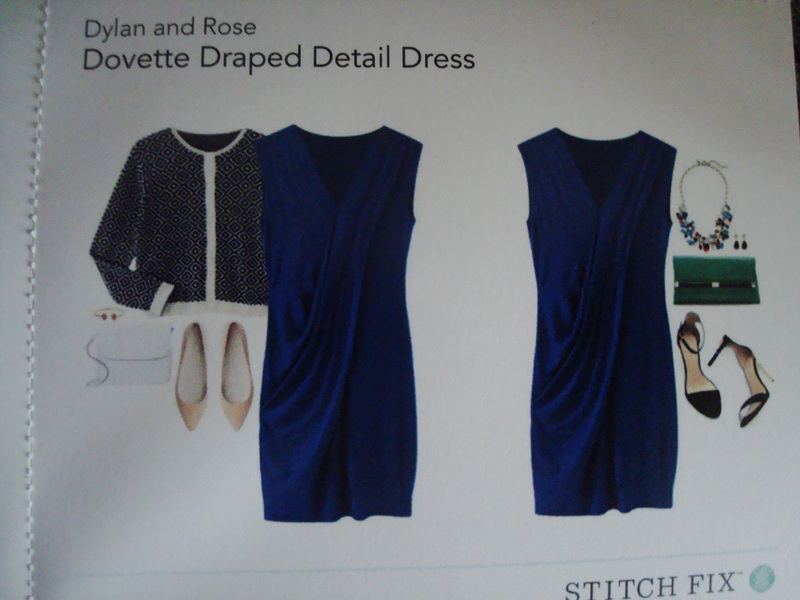 Posted on May 10, 2014, in Reviews and tagged beautiful, reviews, shopping, StitchFix, subscription boxes. Bookmark the permalink. 2 Comments. Thanks for such an honest review! I read so many raving reviews but had a hard time believing that it works on everyone. Hi, Valerie! Thanks for commenting! I had read so many positive reviews as well so I wanted to try it myself. I think SF works for a lot of people, but I think more of a certain body type or without a real sense of their own style. I’ve got one more box coming this week, but I think it might be my last…we’ll see! I hadn’t heard of Vain Pursuits before – I’ll check them out. I’ve tried Ipsy Glam Bag, BirchBox & Julep in addition to the StitchFix boxes. Julep is probably my favorite – love the nail care & colors! For some of my reviews, I receive books and other products from those who produce them in exchange for my HONEST opinion. There is NO monetary exchange for any of my reviews. For all reviews, I state how I received the item before posting my honest opinion.